Humans love crates and they’re a great management tool, but if they’re not introduced properly, dogs quickly learn the crate is NOT the best place in the house. Think of it like this: If your boss took away your big spacious office and moved you to a little cubicle, it wouldn’t be much fun. But, if you got a $30,000 bonus for the move, you would learn to like it a little bit better. For dogs, food, treats, and chewies are like money. We’re using them as a bonus to make the crate more enjoyable. Crates can be a very positive, important tool in housetraining and overall training. Crating is not cruel. If introduced properly dogs love their own “room,” a space they can feel safe in and retreat to when they feel stressed or tired. Dogs that are crate trained can travel safely, stay in hotels and adjust to future boarding, surgery, etc.. Always make the crate a “great” place to be for your dog. Feed at least one meal a day in the crate and also have special treats that you only give in the crate. Feeding in the crate makes crating a part of your dog’s daily routine. Feeding in the crate forces us humans to be consistent and crate even if we have a three-day weekend or a week off work, so the crate becomes a habit and a part of their daily routine. Feeding meals in the crate makes the crate a positive place where wonderful things happen every day of a dog’s life regardless of changes in our schedule. If a dog has never been crated before, you must introduce it slowly, putting food just inside the crate and eventually moving it to the back of the crate. The goal is to eventually close the door but the process should be done gradually. Ideally, crates should be used for no longer than four-hour intervals. A dog should not be crated while an owner works all day. Think about it. You use the bathroom at work, so why would you expect your dog to hold it all day? It’s a lot to ask. Also, small dogs/puppies = small bladders. A crate should be large enough for a dog to lie down and turn around. A crate that is too large will give a dog the opportunity to mess in one area and lie in another. Putting warm blankets from the dryer in the crate or placing it near a heating vent will also encourage crate use for very young puppies or breeds that that love warmth. Make the crate a magical place for your dog by hiding treats in it when he isn’t looking or putting a thin line of peanut butter on the back wall so he will go in there and find that surprise. He will get in the habit of entering his crate to see what wonderful surprises might be in this great place. If the dog is resistant to a crate initially, give ALL meals and treats in the crate. Then place the dog in the crate but do not leave the room. Allow the dog to remain in the crate for just minutes, gradually increasing the time and eventually leaving the room and then the house for short intervals. The goal is to condition the animal to see the crate as positive and short-term and to assure him that you are returning. Never let a dog out of the crate until he is quiet. Otherwise, he will quickly learn he can get out of his crate by exhibiting negative behavior. Be proactive so he doesn’t start crying or digging. 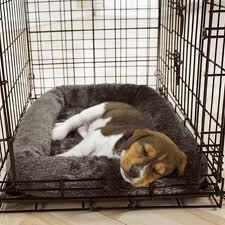 Remember we want the crate to be a great place not a source of stress for your dog. Play soothing music or a sound machine for the dog while he is crated. Put dim lighting on to encourage quiet time. Some dogs do better with a blanket draped over their crate. DO NOT just crate your dog when you are gone, your dog will quickly learn to associate his crate with being alone. Ask yourself: What does crating mean to my dog? Remember, your job is to convince your dog that the crate is the BEST place in the house!